What is Texas Child Care Quarterly? 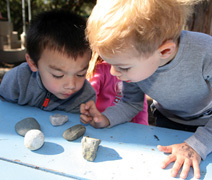 Since 1977 the state of Texas has made Texas Child Care Quarterly available to child care providers and other early childhood education professionals. Its mission is to improve the quality of early care and education practices by building the skills of the adults who support children’s growth and learning. Through the Summer 2011 issue, the journal was printed and mailed free to all regulated child care facilities in Texas. The journal was also available by paid subscription to others in Texas, the United States, Canada, and Europe. Beginning with the Fall 2011 issue (Vol. 35, No. 2), the journal became available only as an online publication, free to everyone. Who publishes Texas Child Care Quarterly? The Texas Workforce Commission, the agency charged with helping Texans find jobs, publishes the journal. Using federal funds, the commission works through local communities to make child care available and to improve the quality of the care children receive. Other state agencies, notably the Texas Department of State Health Services and the Texas Health and Human Services cooperate in preparing the content of the journal. Author opinions do not necessarily reflect the position or policy of the Texas Workforce Commission or imply endorsement. Differences of opinion are welcome. Prior to a publication decision, articles are reviewed by early childhood professionals, including blind review by members of an Editorial Review Committee, for content, writing style, and appropriateness. Authors are responsible for accuracy of all statements and references. How is Texas Child Care Quarterly managed? The Texas Workforce Commission contracts with the Langham-Parks Partnership for the editorial and graphic development, management, and production of the journal. The website will be updated every three months, in March, June, September, and December. Can I copy articles that appear in Texas Child Care Quarterly? Yes, if the copies are to share with parents, teachers, or students, or for personal use. Copies may not be sold. Note that copyright regulations apply. Contact our office with specific requests. Can I get printed back issues of Texas Child Care Quarterly? No, printed issues are no longer available. May I write for Texas Child Care Quarterly? Yes. We accept contributions but are not responsible for unsolicited manuscripts, or photographs. Contact us if you would like to propose an idea or need some technical assistance. Writer guidelines are available. How can I contact Texas Child Care Quarterly? Call, write, or email to contact our office.